It’s the third in a row but it’s different because of Snidero’s new, young, hot rhythm section. Bassist Linda Oh and drummer Rudy Royston bring an unpredictable, loose, edgy energy. 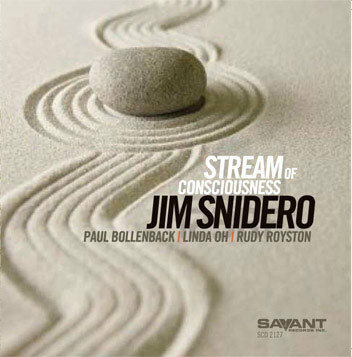 The single most important point about Snidero is that he has one of the cleanest, purest alto saxophone sounds in jazz. That extraordinary tone is beautifully captured here by engineer Mike Marciano. It is a sound so seductive that you can get lost in it if you’re not careful, and miss the continuous subtlety of Snidero’s ideas. Given this ensemble’s distinctive color palette, it would have been nice to hear them apply their sonic signature to some known material. But the leader wants to play his own tunes. Fortunately they are widely varied and mostly interesting. Snidero’s tone is perfect for moody pieces like “Nirvana” and “Vantage.” Both are ambiguous, the first harmonically, the second rhythmically. On “Nirvana,” Snidero’s soft treble piping is breath become thought. On “Vantage,” he starts plaintively, hovering in space, and then flows into time and gets surreptitiously harder and faster. When Bollenback takes a twangy, slightly nasty guitar solo, it fits. Snidero naturally gravitates toward modal scales as creative contexts for improvisation, like the title track and “K-Town.” On the latter, Bollenback, harmonically stationary, lashes Snidero forward. But with Snidero, you keep coming back to that gorgeous alto saxophone sound. It is almost an end in itself. You could call it ear candy if it didn’t contain so much fresh, intelligent content.